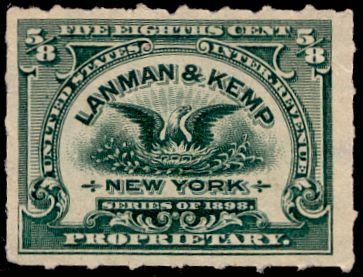 The Lanman & Kemp firm began in the 1830's and flourished for the rest of the century. They were wholesale druggists, and manufactured some toiletries as well. During the Civil War tax period their private die stamps were used on perfumes and the like. 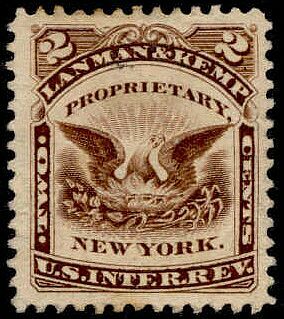 The one-cent stamp was issued from March of 1864 until June 5, 1883. 1,732,040 were printed on silk paper and another 2,813,190 on pink and watermarked papers. This one was printed on silk paper. 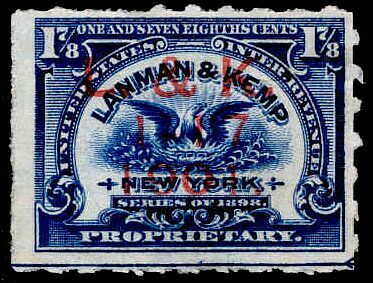 628,600 of the two-cent stamps were issued from 1877 until January 26, 1881, on silk and watermarked papers. The one above is on watermarked paper. 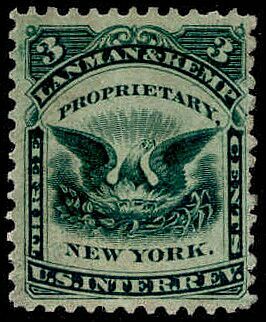 The three-cent stamps were issued from 1874 until January 11, 1883. 290,660 were issued on silk paper and 575,238 on watermarked paper. This example is on silk paper. A receipt for payment in gold issued by Lanman & Kemp. 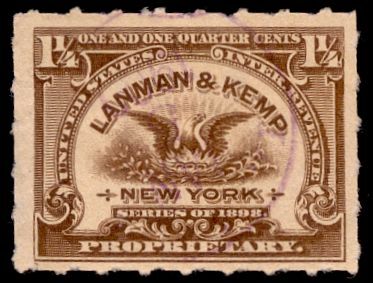 Lanman & Kemp used a variety of checks with imprinted revenues. This one, bearing an RN D-1 imprint, was written to the firm of McKesson & Robbins. Lanman & Kemp liked their phoenix design so well that they had it registered as a trademark. 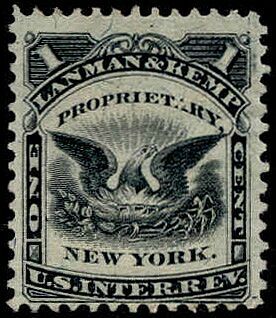 When the Civil War proprietary tax was repealed, as of July 1, 1883 a number of companies that used private die stamps had facsimile labels created for their products. Lanman & Kemp was one of these. They also used private die stamps to pay the proprietary taxes imposed to help pay for the Spanish American War. 5/8 cents paid the tax on a twenty-five cent item. 360,000 of these stamps were printed and perforated first by rouletting, then later by hyphen hole perforations. This one was rouletted. The 1 1/4 cent stamps paid the tax on a fifty-cent article, and the 1 7/8 cent stamp on a seventy-five cent item. Holcombe reports that 20,000 of the former were printed, and 80,000 of the latter. If this is correct they are not difficult to find, considering how few were printed. The example on the left above is rouletted and the one on the right is hyphen-hole perforated. Robert Murray founded the company in 1808, and was joined by David Lanman in 1835. 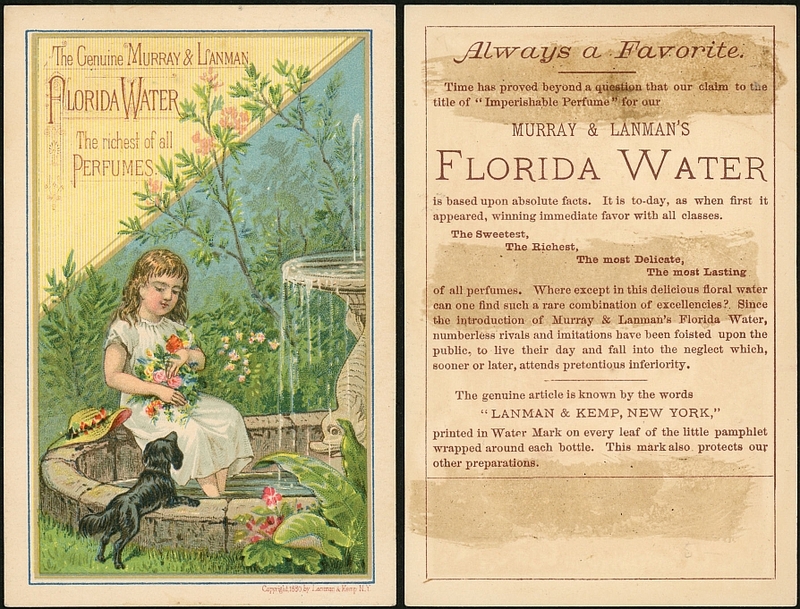 The company continued to use Murray & Lanman in the name of its products, and may continue to do so, as the company still exists.